Possible battery issue. Or grounding. https://www.tuffyproducts.com/ these guys make them. You need new battery. I had to replace mine after only 3 years from similar issues giving me that message. Should be able to just swipe the radio bar down to make it go away. Swiping up from bottom will bring it up which you can enlarge too. I had to get the update also. Additionally, the connector for the screen is accessible from behind the dash glove box. You will have to remove it as if changing the cabin air filter then reach up. I had mine go blank once and dealer just opened it, messed with connector, then it worked again. I bought the Nitto Ridge Grappler in 35”. They are also a 12 ply. By far the best tire in my opinion. Also has a nice beefy look to them. Both side have different design to choose from. Very quite and smooth too. Try full tank of highest octane fuel and add a whole large bottle of Marvel. Sometimes the fuel system just needs a good reboot. Seems like these trucks require more fuel maintenance and higher octane to run at their best. Had same issues with Theft Deterrent message and StabilaTrak message. Replaced battery and problem solved. Also cleaned out grooves in both sets of keys. Battery was 3 years old. Tested and was running hot; bad cell. Battery box area is a tight squeeze. Good luck all. You will have to search by the size you want. They vehicle search is for stock manufacturers recommended sizes; it doesn’t allow for upgrades that were put on truck. I recently got the ridge grapplers and love them. Great look and quiet ride. Whole kit by Rocky Ridge. 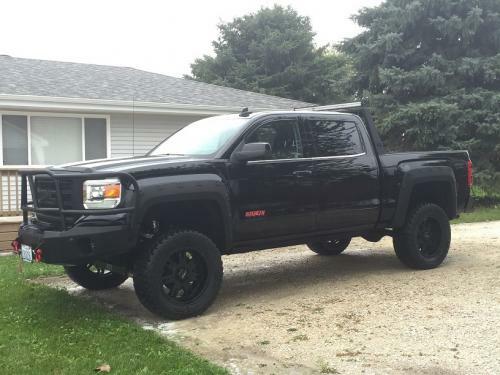 2015 GMC Sierra SLE with Rocky Ridge Stealth Lift Edition.